so as not to cut all the way through. Repeat with all the halves. 2 Place on a baking sheet, rub over the coconut oil and scatter with 1 tbsp of the rub. Push the bay leaves in and around the squash. Roast for 1 hour until caramelised and soft. 3 Meanwhile, make the flatbreads. Place the flour and salt in a large bowl, stir in the yogurt, coriander stems and the coconut flavouring. Bring together with a fork then knead gently with your hands on a lightly floured surface until the dough comes together. 4 Divide into 8 balls and roll each one out to 2mm thick using a rolling pin. Warm a non-stick frying pan over a high heat and cook each flatbread without oil for 1 minute on each side, followed by a further 30 seconds on each side, until puffed and golden. Set aside in a clean tea towel to keep warm while you cook the rest. 5 Toss the seeds in the remaining rub, scatter over a baking sheet and toast in the oven for 5-7 minutes until golden. 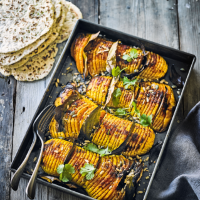 Serve the butternut drizzled with any cooking juices, sprinkled with the coriander leaves and toasted seeds and with the flat breads alongside. Delicious with a green salad with bitter leaves.